Horze Zebra Combo Neck Fly Sheet. Keep summer bugs away with this combo anti-fly sheet with Zebra print pattern. The way the light reflects off the Black while not reflecting off the White confuses the flying pests and they choose to attack another animal instead.The strong fabric and handy closures make it perfect for hot days, and the lycra at the withers and lining in the neck add soft comfort. Neck piece is not detachable.The tail flap adds coverage over the tail. Machine Wash - Warm (with similar colors, Line Dry only. No bleach, do not dry clean. Integrated neck piece with velcro straps. Buckle closures and hook-and-loop straps. Large tail flap. leg straps. Have your horse stand still (if possible!) on flat, level ground. 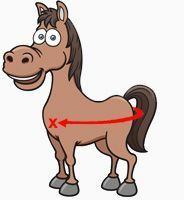 Measure from the center of your horse's chest around the shoulder at the widest part, to the center of the tail. This measurement is easiest to obtain with a soft fabric measuring tape. This measurement - in inches - is your blanket size.